Discussion in 'Herp Help' started by LilithLeChat, Jun 9, 2018. After wanting a snake for years, and researching information of what would be a best beginner snake, plus what do I need to get and do for its physical well-being, I have finally bought a juvenile Diamond python about a month ago. She* is a great feeder and handles beautifully. After spending a couple of weeks in its hide, she first started staying out at night, and in the last week or so she’s out during the day as well, curled up in the fork of the twigs I provided for her inside her click-clack. I keep her click-clack inside the 6ft enclosure that I’ll move he into once she’s big enough. She’s around 50cm long at the moment. While there’s plenty of information about taking care of her physical needs, I can’t find much information about their behaviour, so I have a million questions. But I’ll start with the behaviour I observed last night. She dipped her entire head under water several times and moved around her water bowl with her chin pressed against the bottom, keeping her body out of water. Then she came out and started rubbing the sides of her mouth against her body, and the twigs. She repeated that dipping/rubbing procedure a few times. I’ve been looking out for the milky eye as a sign that she’s about to start shedding, but her eyes seem clear and have been since I got her. Could this be a sign that she’s about to shed? She’s become quite active in the last week, but it could be due to her getting used to her new environment. She has eaten four days ago, and so far has been defecating 5 days after each feed. I handle her daily for 20-30 minutes and use that time to observe her condition and check for any changes. If her dipping her head in water and rubbing it against herself and the twigs is NOT a sign of shedding, is it something I should be concerned about? And if she is about to shed, do I need to provide her with a deeper water dish? The one inside her click-clack is only as deep to cover the top of her head when she has her chin on the bottom. I have also seen advice to mist shedding snakes. 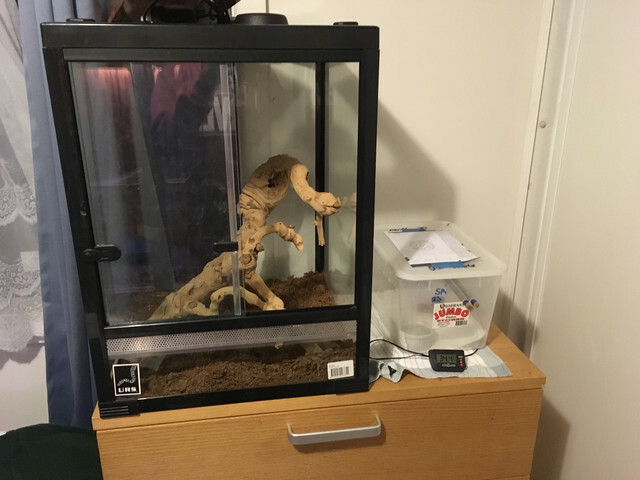 Should the misting bottle be kept inside the heated enclosure so it is the same temperature as the environment? I’ve been told by the seller that she’s a couple of months old. She’s around 50cm long. Does that seem right? * I actually have no idea whether she’s a she or a he, as I was told she’s too young to be sexed. I figured that I have 50% chance of being right, and if she is a he, I doubt he’d care whether I’m right or wrong. So far I have no plans on breeding snakes, so it’s irrelevant. How do you control the temp in the click clack if you have it inside a larger enclosure, which I'm assuming you are using as the heat source? Young diamonds, first winter its normal to heat 24/7 BUT they must have access to a cool end to enable thermoregulation. Temp should be around 32-33 at the hot end but low to mid 20's at the cool end. Misting is not needed although I will happily spray the tubs of young diamonds once a day once I see they are coming into shed. I believe it helps with the humidity this time of year when its naturally lower. Young snakes often do strange things and the behaviours can vary from one to another. Taking a dip in the water is not unusual for any young snake, the rubbing could be a sign of impending slough but then again it might not be. Handling is not something your snake will ever 'enjoy'. I understand its difficult to leave them be but 20-30 mins a day is extremely excessive in my opinion. At this age handling should be on an 'as needed' basis such as when you are changing substrate and should never exceed more than a few minutes. Excessive handling can lead to the animal becomming stressed. Stompsy and Ropey like this. I am no expert but it sounds like he/she could be about to shed. Currently I can't tell my snake is about to shed by his eyes, haven't got to that level of expertise yet, but can tell by the dullness of his skin. The difference is night and day between before shedding and after shedding. 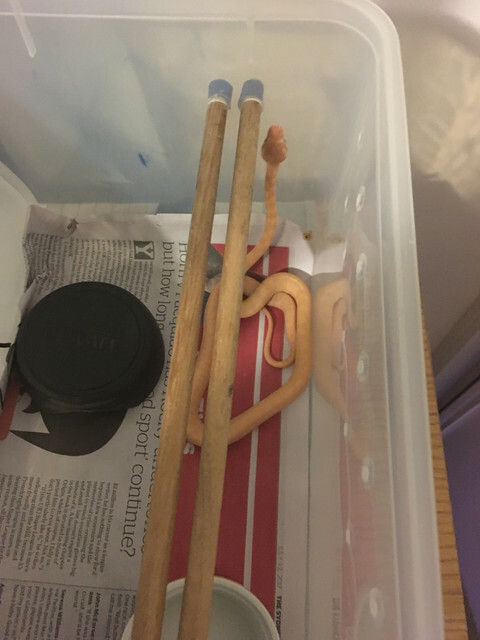 My snake (Choc), a Darwin cross Jungle, was born last November and is about 60cm and I feed him twice a week on pink rats. I wouldn't worry to much about your snakes behavior unless he/she stops eating or hides away even of a night. Easy with diamonds. About 3 days out the belly starts going milky. Chipewah and Ropey like this. @Pauls_Pythons, the click clack is on the stand inside the enclosure with heat sensor half-way up the wall nearest to heat lamps (inside the click clack). The temperature reading at that spot is always around 30 degrees. When I was discussing the set up with the seller, that’s the advice I got. I don’t want to harm her, so I’d appreciate any suggestions how to ensure that she gets both hot and cool area inside her click clack. Regarding handling, that was another question I had. When I try to return her to her click clack after handling, she seems reluctant to go in and wraps really tight around my fingers. Also, one time I just took her out to clean the poo and then returned her back inside, she acted agitated and kept on trying to get out. I know that snakes are nothing like dogs and cats and don’t form attachment to humans, but could it be that she got used to a certain routine and was agitated because it didn’t go as expected? Most people with a single snake in a click clack set up will use a simple heat cord set up under about 1/3rd of the click clack which will obviously concentrate heat to that end. There are a few options but that is probably the simplest and most commonly used. I suggest looking through previous threads on the subject as there are many and you should find some good ideas. That behaviour isn't unusual but is often interpretted in the same manner as you have. To me it simply suggests that your animal is not comfortable in that set up. 30 degrees all over the tub is too warm, (doesn't give the snake the opportunity to thermoregulate) and while diamonds can manage temperatures well in excess of the 32-33 I suggested above they need to have the option to go somewhere cooler. In the short term the snake will just become stressed, in the long term there are potential health issues that can arise from inappropriate temps and diamonds are one of the species that are mose sensitive to this. What size will she have to be so I can transfer her into the enclosure? I was told that juveniles would feel too stressed in the full enclosure, but I can’t find any info on when is the right time to move her? 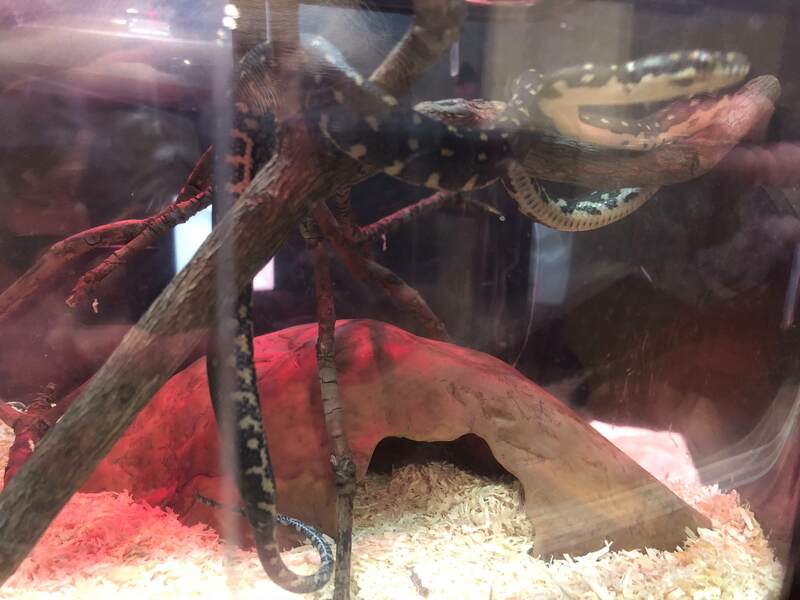 6ft is a massive enclosure so depending on the design you could look at sectioning a smaller area off and extending the enclosure as the snake grows. A youngster would be fine in a smaller enclosure, say 2 x 2 x 2 so long as there are plenty of hides, its appropriately heated and not in a high traffic area. 6 ft tall, about meter wide and 60 cm deep (approximately) with two basking shelves. There’s also a gnarled branch that goes from the bottom almost all the way to the top to be put back in once she’s got the full run of the enclosure. Not a high traffic area either. Here’s a video of her feeding. How can I tell when she needs to be fed larger mice? I feel a bit dumb, but could u explain the heat setup a bit better please? I was given a bad advice on how to set it all up, but now I know better, I will rectify it ASAP. @Pauls_Pythons , I’ve been doing some reading and there’s a bit of a debate of heat pads vs heat cords. Any particular reason why you suggested a heat cord? If I use a heat mat, is it safe to have it directly under click clack or will I need a tile for it too? Heat cord and heat tape in my opinion is good for multiple tub setups. A good quality Heat mat is good for single tubs, however I would NOT have it set up inside the large enclosure. I’ve been doing some reading and there’s a bit of a debate of heat pads vs heat cords. Any particular reason why you suggested a heat cord? In my opinion heat cord is more reliable and certainly more user friendly than heat mats. Mats are designed for glass bottomed enclosures and people often use them incorrectly. Certainly not something to be used inside your current set up. There is nothing wrong with a simple light globe set up either and if using globes, if set up with the correct wattage there would be no need for a thermostat so long as there is a cool end available to the animal. I have a couple of diamond holdbacks that are only 18 months old in enclosures heated with party globes. @Bl69aze, is there a reason why it’s not a good idea to have a click clack inside the big enclosure if I turn the enclosure heat lamps off and just use mat/cord? I have three cats and the current set up prevents them from being able to get at the snake, so unless there’s a good reason to take the click clack out, it’s safer for the snake to be inside the enclosure. 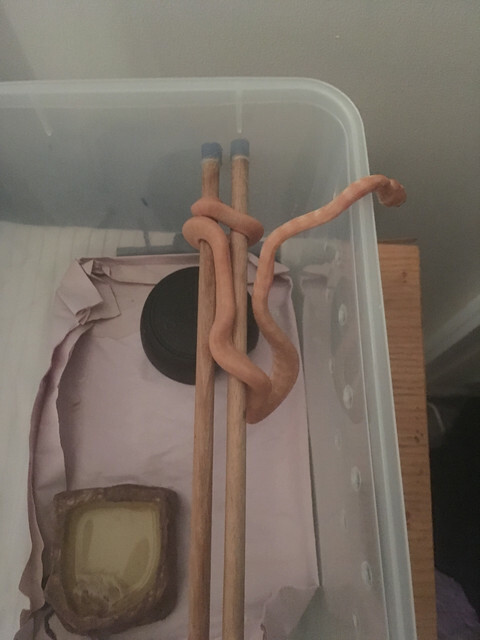 What kind of snake is the one in the picture? Will it stay that colour when it grows up? @Pauls_Pythons, the current problem with hot/cool spot is that the click clack is fairly small so the lamp would heat it evenly. It seems to me that heating up only one third of the container would solve that problem, so I think I’ll go with that. i guess its more of a safety concern for your snake... the thing with heat mats is, they go under the tanks, as if something did happen, they can cause damage to snake. I'm also not to sure how you'd go about setting up. Cats are showing no interest in the enclosure, and they’ve learned their lesson not to jump on the fish tank the hard way (spray bottle), so they won’t be jumping up there either. Also when they sniff my hands after I’ve been handling the snake, they are indifferent. Another behaviour question I have: Cassandra has been creating “walls” inside her hide using the bedding. In the picture you can see how she has pushed up a pile near the entrance. I guess it might be either temperature issue again, or maybe the hide is too big for her? I’ll get the IR temp gun first and check each part of the click clack first before I make any major changes, if she’s trying to get warmer. Please explain to me how a cold blooded animal is going to get "warmer" by burrowing??? the current problem with hot/cool spot is that the click clack is fairly small so the lamp would heat it evenly. It seems to me that heating up only one third of the container would solve that problem, so I think I’ll go with that. If you can achieve that through placement that would be sufficient in the short term. Not sure on your set up but I think you will struggle to achieve your goal though I could be wrong.